When people are looking for Chef’s Choice sharpeners, they know what quality they’ll get from this American-made company. If you decide to buy a 3-stage electric knife sharpener, then a comparison is needed to ensure you’re getting the correct type. This article is about choosing between Chef’s Choice 1520 AngleSelect and Chef’s Choice 15 Trizor XV EdgeSelect for your home kitchen knife sharpening needs. We see queries floating around when we browsed the net, all about the differences between 1520 and the Trizor XV. Intrigued by these FAQs, we decided to make a comparison and share with others. If you’re interested in any of these models and want to know the differences before getting one, please read on. Let’s compare the differences between the Chef’s Choice 1520 and the Trizor XV. From the above comparison, we can see there are some differences in the features. The model 1520 can sharpen both 15 and 20-degree class knives whereas the Trizor XV can only handle 15-degree edge. Firstly, let’s make it clear the model Trizor can convert any 20-degree edge to 15-degree, and it’ll only handle 15-degree style knives. This is the feature where the Trizor stands out. Although model 1520 is versatile to handle both classes of knives, it will not do any edge conversion. Also, the Trizor is a heavy-duty sharpener with the pre-sharpening stage to do the toughest work. The heavily worked knives can also be reconditioned to restore its sharpness. Versatile – Sharpens a wide variety of 15 and 20-degree class knives. For professional chefs and veteran cooks who wish to keep and restore different types of angle edge blades. Although newer American/European class knives have converted to 15-degree edge, some people would like to keep the conventional 20-degree edge for other purposes. Whenever more functions are packed into one unit, the flip side is, it always comes with some minor disadvantages. Be aware of what class of knives and slot to use. These are the key points to remember prior to using the Chef’s Choice 1520. Always use the first stage for Asian style knives and the second stage for Euro/American knives. The sharpener will not ruin expensive knives; it’s always the user’s fault. Heavy Duty Sharpener – The Trizor XV can restore heavily worked knives other than the 20 to 15-degree conversion it puts on the edge. The well-designed sharpening angle guides keep the blade stable in all stages throughout the sharpening process. It also puts Trizor edge to the knives for superior sharpness and durability. 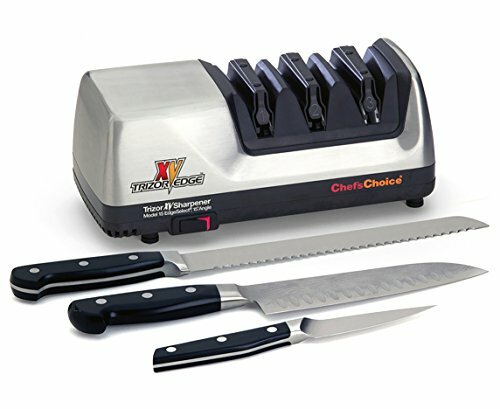 The America’s Test Kitchen company chose Chef’s Choice 15 Trizor XV as the best knife sharpener during a test carried out among other brands of sharpeners. It quickly restored a dull Victorinox 8 inch chef’s knife to a razor-sharp edge. It also cut better than a brand new Victorinox knife. If you want a heavy-duty sharpener to convert a bunch of 20-degree class knives to 15-degree edges, buy the Trizor XV. On the other hand, if you want a versatile sharpener to handle both classes of knives, then the model 1520 is the best choice. Before you buy a sharpener, always know the types of knives you have. Buy the best electric knife sharpener only to maximize sharpening efficiency, not to damage the knives. Remember, the sharpening angle of the machine must always match the bevel angel of the knife. As a matter of fact, both sharpeners are over $100. Since it’s a small investment, know which sharpener best suits your sharpening needs. People tend to look for a cheaper alternative to fit the budget and we’ll strive to help. 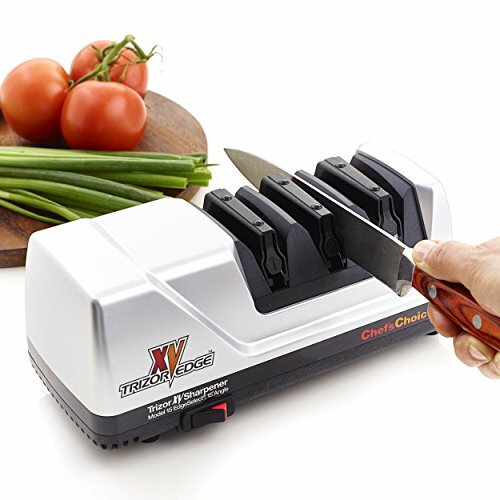 As we dug further, unfortunately, we could not find any cheaper Chef’s Choice 3-stage electric sharpener that has the same function and efficiency to replace the model Trizor XV. Fortunately, there is a cheaper alternative that has similar function like the Trizor XV. This little brother is the Chef’s Choice 315 XV. With a price of less than $100 and a warranty for 2-year, you’ll be happy to settle for a 2-stage electric sharpener. 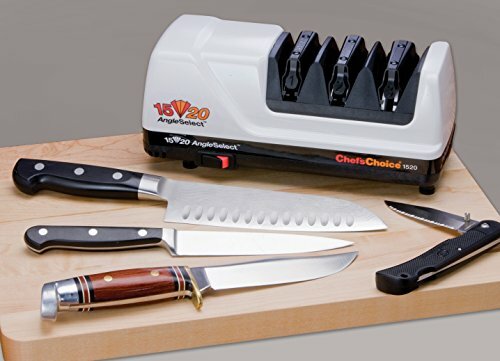 Chef’s Choice claims that it is the budget-friendly 2-stage sharpener of the critically-acclaimed 3-stage Trizor XV. In fact, there is another model similar to the model Trizor XV but it’s expensive. The amazing sharpness you get from the Chef’s Choice Model 151 Stainless Steel Universal Electric Knife Sharpener is almost near perfection. The brushed stainless steel body is well-made and sturdier than the Trizor. Of course, based on its price and quality the model 151 also comes with a 3-year warranty. Some people may like solid-built stainless steel body like an armor, don’t hesitate to check out the reviews. Have you heard of a company called Wusthof? They’re famous for manufacturing high-quality knives. The model Wusthof PEtec is another quality electrical sharpener we’d like to share. The Wusthof PEtec is another high-end model from EdgeCraft, similar to Trizor XV. It sharpens 14-degree class knives and it can do what the Trizor XV does. The Trizor XV converts to 15-degree edge. With 1 degree apart, you won’t see the difference. Both the Chef’s Choice 151 and the Wusthof PEtec can deliver amazing sharpness but it’s never a budget-friendly sharpener. It’s just a personal choice whether you choose model 151 or the Wusthof PEtec. After all, both models are worth considering if your objective is to turn dull knives to super sharp edges, even sharper than brand new. However, the Chef’s Choice 315 XV is a budget-friendly replacement of the Trizor XV if you only need a simpler sharpener. As for the Chef’s Choice 1520, there is a similar model with very good reviews. 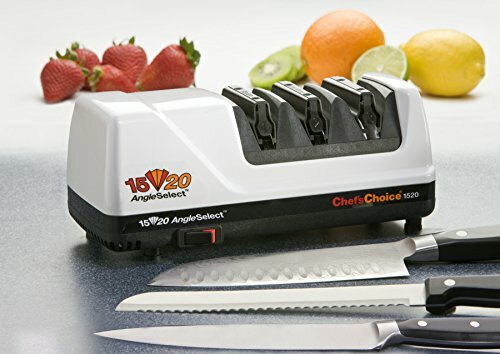 The Chef’s Choice 290 AngleSelect Hybrid Diamond Hone Knife Sharpener may be a good replacement for model 1520. The only difference is the stage 3, it’s in manual mode. You’ll need to polish the knife manually, not electrically. There are pros and cons, it can sharpen both 15 and 20-degree class knives like the Trizor XV and it’s also cheaper but it comes with only one-year warranty. The 3-stage model 1520 (fully operated by electrical power) may not be appealing to some people due to higher cost. In view of this, the 290 Hybrid Sharpener is a good replacement. Want to convert 20-degree class knives to the thinner 15-degree edges? The first choice is to buy the Trizor XV. Otherwise, get the cheaper model 315 XV, if you don’t mind it is only a 2-stage sharpener. On the other hand, the model 151 and the Wusthof PEtec are high-end sharpeners only a few people are willing to invest money in it. Want to restore both classes of knives in one unit? Buy the Chef’s Choice 1520 or the cheaper model 290 Hybrid sharpener if you like a little manual work to polish the knives. We hope this article will help users make a better buying decision. If you find this article useful, please share with others.